What more is there to say, since my last “pre-review” post. *sigh* It wasn’t bad. I mean, Jeaniene’s story building, characters and “paranormal world” are solid enough to make good books (even out of this boring one). Usually her books bypass “good” altogether, though, and are simply amazing! The dilemmas that present themselves in each installment are usually exciting, and the tension between the characters (whether they are in love or in hate) will turn your reading-world upside down. But for some reason, I was absolutely bored for three quarters of this book. Dare I say, I came close to putting it down and considering it a DNF (did not finish). 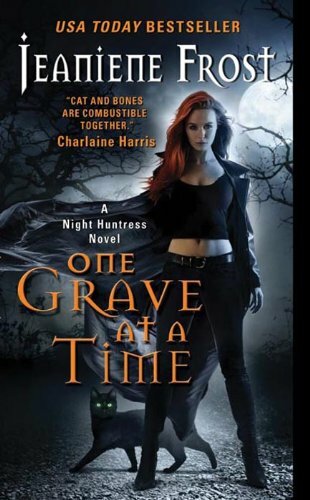 *GASP* That would have simply broken my heart, because Cat and Bones are a part of my paranormal reading history. But many of you were right. The end was exciting. Well at least exciting for this book. In the past, I’ve been terrified, stupefied, and awe-i-fied ( 🙄 I know… I know… ) with six of her Night Huntress related books. Yup! Even her spinoffs wow’d me. Oh how I still heart Mencheres. The PERFECT vampire. But I digress. The last two in the main part of the series have left me shrugging with indifference, and this one most of all. Why was this ghost so important? He was the German Inquisitor responsible for the witch hunts, and mass murders of women that he so ruthlessly tortured and killed. He may be dead now, but his witch hunt is not over. He is powerful, and seemingly not a typical “ghost”. Occasionally he is able to become solid, with his power and age, causing direct harm to those around him. But his “ghostly energy” is just as dangerous. Wielding knives, toilet seats, even cars to destroy those in his way. Every Halloween he becomes physical for a full 24 hours, while three female victims that he has terrorized over the course of weeks (via creepy “Paranormal Activity “tactics) are tortured and sacrificed for his witch-hate. “And what does he do on Halloween?” I’d bet every drop of blood in my body that Kramer didn’t spend it trick-or-treating. “He extracts ‘confessions’ of witchcraft from three women whom he’s coerced a human accomplice into kidnapping and the he burns them alive,” Elisabeth replied, a spasm of pain crossing her features. It was official. I now wanted to murder a ghost, a notion I’d discarded as unlikely only twenty minutes before. Problem was, killing vampires and ghouls was my specialty. Not people who were already dead dead. So that’s it. They have to find the next three girls he will be targeting, and they have to get rid of him. He’s just too evil. Okay. So that’s really it. A few mysteries to solve, a few new good-guys added to this Cat and Bones “superhero” crew (including a human medium reminiscent of True Blood’s “Lafayette”) and a bad guy or two to figure out. Oh, and an exciting-ish ending! How are Cat and Bones? Good. Really good. So good that the story is not about them anymore, other than the occasional sweet moments that they (momentarily) share. “The last thing you need to fret about is my feeling emasculated, Kitten; but talk is cheap, so I’ll be sure to show you later. His voice was rich with so many undercurrents, I grew warmer just listening to him. Then Bones’s expression became serious, and he leaned forward to brush my hand. *sigh* Bones… you still rock! But as I was saying, “momentarily” is the key word, when it comes to their time together, because they are just so darned busy trying to save the world. But they (as in Cat and Bones, the lovers) are barely there in this installment. You may as well resign yourself to that fact. I, on the other hand, love to read a book that puts my heart and my adrenaline on overdrive. And can we hurry with Ian’s book? I have a feeling that bad-boy vampire is going to be my next serious crush!! Whoa, he is just soooooo…. okay. I’m saying it. HOT! Ian appeared to have recovered from his surprise. He gave Spade an almost accusatory look. I still loved it. Though yes, it was my least favorite of the series, Cat & Bones and the rest of the crew (yes, I LOVE Ian) still had me up late reading. You are right though, there just wasn’t enough Cat/Bones LOVIN’!!!! And that freaking sage got me a little nuts too. But I still have to say…..I still loved it, and never felt like putting it down. I can’t wait to read Vlad’s book! Ok I love this series but have to agree. The last 2 are missing the angst and passion that I loved so much from the others. I enjoyed this one because I love the characters but not nearlly the same as the first 4. And I also loved the “spin off” books which I was not sure I would. I just hope the next ones get back to the greatness of the first 4. Wow, I was so disappointed when I read your first post on One Grave, that I started Envy instead! It’s looking good so far…. I was still disappointed and I still think that most of it reminded me of a Scooby-Doo costume. Although one of my favorite parts was when Bones gave that paranormal human the slap from across the room & Cat is like really I did not know you could do that. In his normal attitude he just shruggs like whatever, I’m good and we both know it. I still love Bones though. Let’s not forget when her Mom tries to take a bite out of the victim and then confesses to be straining blood from the butcher’s meat. I mean not even the florist could belive that. I did like those parts when normally I love the whole book and read it 2 or 3 times. I could barely make it through this entire book. I hope that she takes all of this to heart and goes back to our originally beloved Cat & Bones and for goodness sakes please let’s get her mom and Ian hooked up with someone.